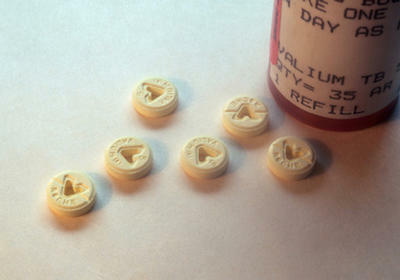 Benzodiazepines, the generic name for a family of prescription drugs that include Xanax and Valium used to treat anxiety and insomnia, raise the risk of developing dementia within 15 years by 50 percent. An alarming study found that the drugs, which are used to treat anxiety and insomnia, increased risk in people over the age of 65 who had used benzodiazepines. French researchers studied men and women (average age of 78) for 20 years. All were free of dementia when the study began in 1987. During the first five years of the study, researchers indentified which factors led to people taking benzodiazepines. During the remaining years of the follow-up, the researchers evaluated the association between beginning taking the drugs and the development of dementia. Other factors that might affect dementia, such as age, gender, education, wine consumption, diabetes, high blood pressure, cognitive decline, and depressive symptoms, were also taken into consideration. Of the 1,063 men and women, 95 began taking benzodiazepine during the study. At the end, 253 (23.8 percent) of the participants had developed dementia — 30 in those who used benzodiazepine and 223 in non-users — which translates into a 50 percent increased risk for those who began taking the drugs. Benzodiazepines are some of the most commonly prescribed medications, and in addition to treating anxiety and insomnia, they’re also used as anticonvulsants and muscle relaxants. Benzodiazepines include lorazepam (Ativan), clonazepam (Klonopin), diazepam (Valium), temazepam (Restoril) and alprazolam (Xanax). Benzodiazepines work by binding to the gamma-aminobutyric acid-A (GABA-A) receptors in the brain. Other substances, such as alcohol and barbiturates, bind to the same receptor, which is one of the brain’s most common neurotransmitters. The study, which was published in the online version of the British Medical Journal, indicates that millions of people are at additional risk of developing dementia. According to U.S. government figures, in 2009 there were 45 million prescriptions for alprazolam, 26.4 million for lorazepam, 24.4 million for clonazepam, 14.2 million for diazepam, and 8.4 million for temazepam: That’s a total of 118.4 million prescriptions for benzodiazepines. Although guidelines for benzodiazepines suggest they should only be prescribed for a few weeks, many people take them for years. The study’s authors suggest that doctors should assess expected benefits before prescribing the drugs and limit prescriptions to a few weeks. Tagged anxiety, depression. Bookmark the permalink.